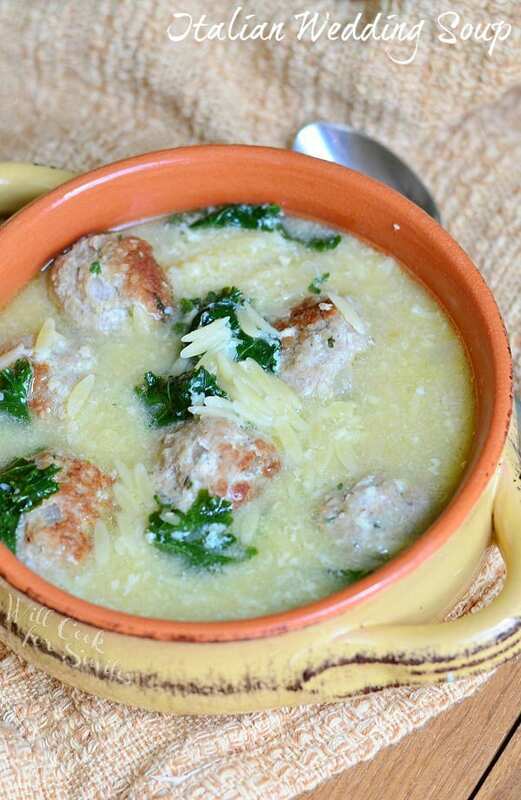 Deliciously comforting Italian Wedding Soup made with an addition of juicy turkey meatballs. 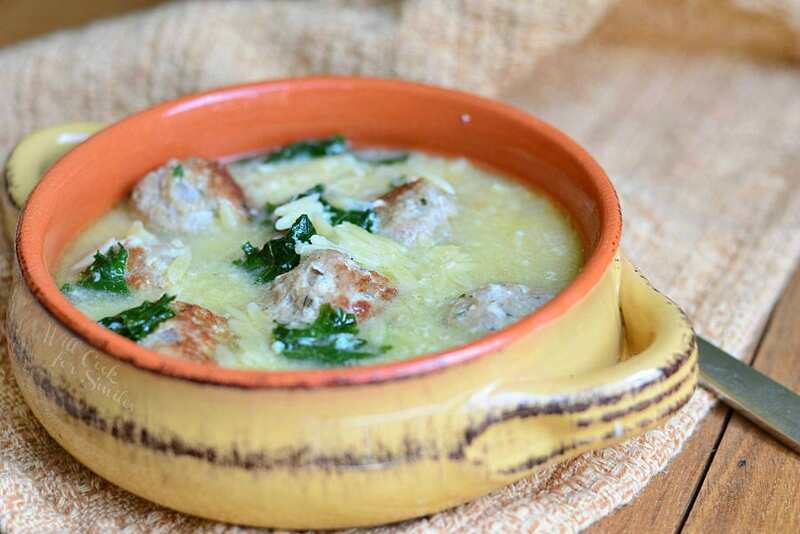 Every bite of this soup is so satisfying and loaded with kale, meatballs, orzo pasta, and Parmesan cheese. I love soups. Every year, I can’t wait to the Fall season just so I can start making all the best comfort dishes, and soups are definitely at the top of my list. It might always be warm in Florida but a nice bowl of soup is still a must during fall and winter seasons. 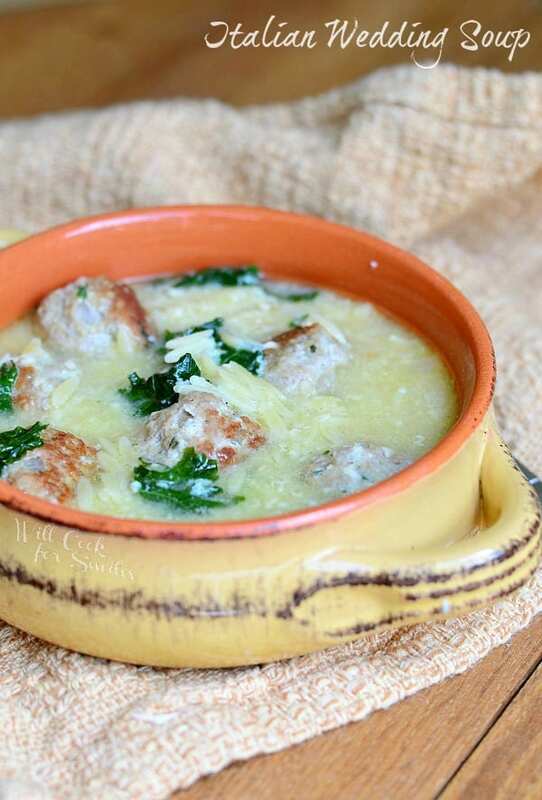 This Italian Wedding Soup is one of my favorite soups to make. As much as I like making all kinds of different soups, I am partial to a few classics like Zuppa Tuscana, Italian Wedding, Tomato Bisque, and Crab Bisque. This version of classic Italian Wedding Soup is great for different moods and occasions. First, there are meatballs and that’s a great addition to any soup that can take it from lunch to the main course easily. You can actually play around and make chicken or beef meatballs here. Personally, I think turkey go best here because they are light and don’t take away from the rest of ingredients. Let’s not forget about kale. Kale is perfect in soup because it holds up nicely to cooking and doesn’t get mushy. There are a ton of nutritional benefits in kale as well. And of course, the cheese! Parmesan and egg is the perfect finish to this delicious, comforting soup. Can the meatballs be made ahead of time? Yes, to save some time you can make the meatballs ahead of time. Prepare meatballs according to the recipe and cook them in the soup pot. Take them off heat and cool enough to be placed in the refrigerator. Cover with a lid and keep in the same pot. The next day, or when ready, start heating the pot over medium heat and continue per recipe. 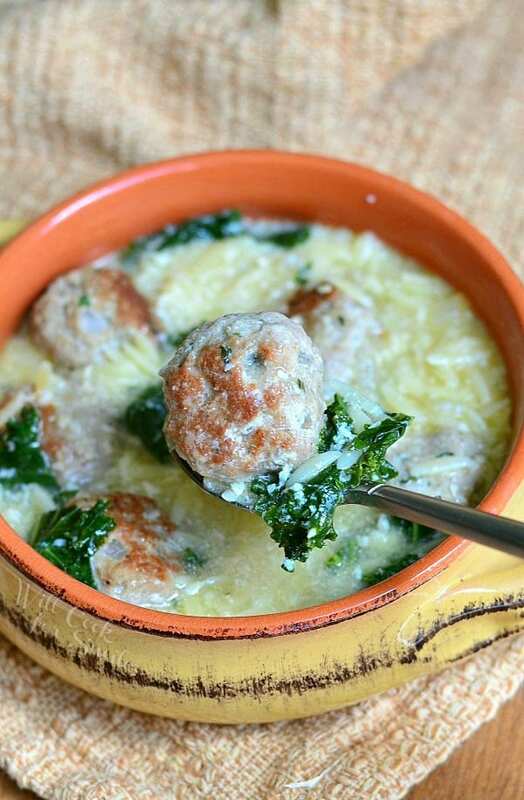 Every bite of this soup is so satisfying and loaded with kale, meatballs, orzo pasta, and Parmesan cheese. In a mixing bowl, combine all ingredient for the meatballs and mix until all evenly combined. Preheat a large pot over medium heat and add olive oil. Form small meatballs and add them to the pot. Cook meatballs over medium heat until about half way done. Add diced onion and minced garlic. Saute for a couple of minutes. Add orzo and chopped kale. Cook until orzo is done. Whisk egg in a small bowl and mix it with fresh grated Parmesan cheese. Once orzo is cooked, start slowly swirling soup (in one direction) and slowly pour in the egg mixture. Cook for about a minute or two and serve. Yum! This soup just screams “fall!” I love the turkey meatballs, and it just sounds like comfort in a bowl! Pinned! Absolutely, Justine! Thank you so much! I love this soup. Thanks so much. Looks so good, my family loves soups and I’m out of ideas we love zuppa toscana so I think this will be so good also! Do you have recipe for tomato bisque soup? They have one called Tuscan tomato at Safeway and it’s so good but I never found a good recipe. Thank you! Hahaha, thank you so much Marisa! I’m actually not that close and I shoot about 5 minutes after I pour it in the bowl, so I haven’t had the steam issue. The Italian Wedding Soup…when you say “Stock” I guess you mean chicken? What would you recomend? Hi Berry! I’m sorry, I usually specify in the recipe but missed it somehow. Yes, I’d recommend chicken stock or you can use vegetable broth if you have that on hand. I hope you like it! Oh boy, hit reply without reading my reply. I’m sorry, Betty! Just made this soup and can’t believe how tasty it is! Definitely a keeper! Thank you!